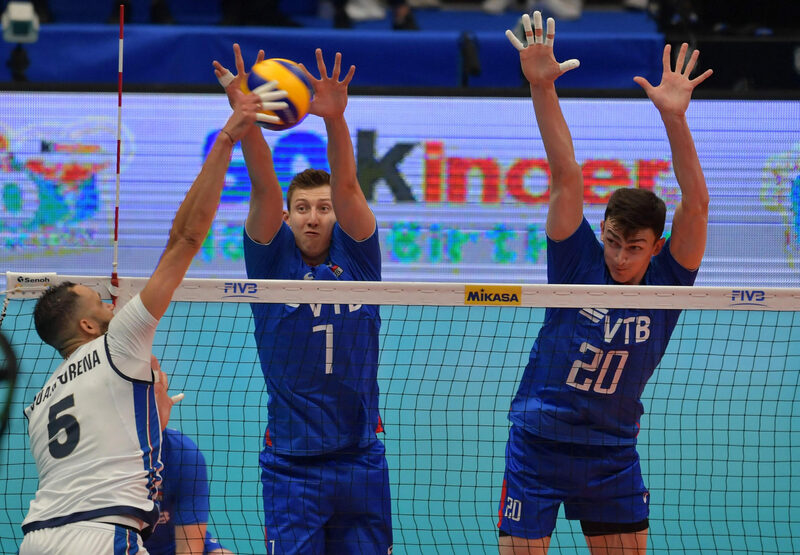 Russia topped Italy in five sets to hand the hosts their first loss of the FIVB World Championships. Meanwhile, Finland was eliminated from the race for the title with a four-set loss to the Dutch. The Dutch overpowered Finland at the net (15-4 in blocks) and from the service line (13-6 in aces). The Netherlands also boasted a 54-45 advantage in kills. Nimir Abdel-Aziz paced the Dutch with 22 points, notching 18 kills, two blocks and two aces. Thijs Ter Horst (16), Thomas Koelewijn (14) and Jasper Diefenbach (10) also managed double-digit scoring efforts. Ter Horst downed 14 kills, while Koelewijn and Diefenbach put up five blocks apiece. Daan Van Haarlem served up three of the team’s 13 aces, while Abdel-Aziz, Diefenbach and two other added two perfect serves. Urpo Sivula did all he could to guide the Finns, tallying a match-high 23 points (20 kills, 2 blocks, 1 ace). Sivula’s nearest help came from Niko Suihkonen, who managed nine points (8 kills, 1 block). Nimir notched seven points in the opening stanza, lifting the Dutch to a four-point edge at 14-10. Sivula narrowed the gap to three at 21-18, but Nimir and Ter Horst closed out the win for the Netherlands at 25-19. Finland turned things around in Set 2, cruising to a 17-10 lead as Suihkonen took control offensively. The Dutch clawed back into the set at 23-22. Sivula kept the Netherlands from completing the comeback at 25-23. The Dutch returned to form in Set 3, going up 8-4 and hanging on to the advantage in a 25-16 victory. Nimir pounded down kills of up to 70 miles per hour in Set 4 as the Netherlands grabbed an 8-4 lead. Finland narrowed the gap to two at 9-7, but it was all over after that. The Dutch claimed victory at 25-13. In a continuing trend on Saturday, it was not a day for the host teams. First the United States downed Bulgaria, then Russia issued Italy its first loss. All was not lost, however, as the host side qualified for the Final Six. The Russians used an 11-2 advantage in blocks to overcome a 55-49 deficit in kills in the close victory. Both teams managed nine aces and committed 34 errors. Maxim Mikhailov led a group of four double-digit scorers for Russia, notching 18 points with team highs of 12 kills, three blocks and three aces. Dmitriy Muserskiy (15), Dmitry Volkov (12) and Egor Kliuka (10) rounded out the top scorers. Volkov and Kliuka posted 10 kills, while Muserskiy chipped in nine putaways, three blocks and three aces. Ivan Zaytsev recorded a match-high 21 points (20 kills, 1 block) and Osmany Juantorena added 16 points with 14 kills and two aces. Next on the team were a trio of players with seven points. Filippo Lanza notched his seven kills in just the first three sets before exiting the game. Zaytsev and Juantorena paced Italy to a 17-13 advantage in Set 1. Russia pulled within two, but in the end Daniele Mazzone capped the 25-19 win for Italy. Russia grabbed a 13-9 lead in Set 2 and held on for the win despite Italy slicing the margin to two at 15-13. The Russians went up 23-16 and Mikhailov tallied his sixth point of the set to secure the 25-18 win and even the match. The Russians hit at a 60 percent efficiency in Set 3 and jumped ahead 18-12. Lanza exited the match for Gabriele Maruotti but could not help Italy salvage a win as Mikhailov wrapped up the stanza at 25-21. The Italians followed their top scorers to an 11-8 lead in Set 4 and on to a 25-19 win to force the tiebreak. After a knotup at 6 in Set 5, an ace by Volkov gave the Russians an 8-6 edge at the changeover. Muserskiy pushed Russia ahead 12-10 as the team went on to the 15-11 win and the match.